A submariner friend from way back emails to question whether I have thrown my support, such as it is, behind Taiwan’s quixotic bid to build or buy a subsurface fleet. Evidently some press accounts say yes. Short answer: no. It’s worth tackling such misconceptions foursquare. Truth is, my advocacy of Taiwan Navy submarines is tepid on its hottest day. That’s why undersea warfare is nearly invisible from my chief works on the island’s maritime defense (here, here, and especially here). Battle fleets meant for commanding the sea are out. “Seadenial” is in. 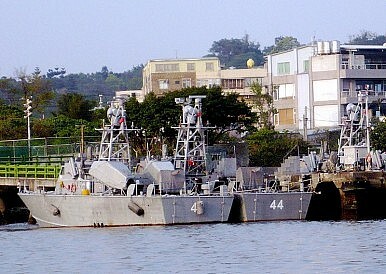 Swarms of small, missile-armed surface craft scattered around the island’s rugged periphery are the weapons of choice. Crowding the seas with such craft is where the ROCN ought to concentrate effort and resources. True, I have mentioned submarines in an offhand way from time to time, citing them as inexpensive platforms that can play havoc with enemy surface fleets. So they are. And in an ideal world, a modest-sized submarine fleet might make a good adjunct to a sea-denial strategy, comprising a threat from below to enemy surface ships. But that’s a technicalandtacticalobservation—and there’s more to the problem than hardware. For one thing, how would Taipei make good on its vision? Taiwanese shipyards’ capacity to construct submarines remains doubtful. No foreign builder is likely to supply the ROCN with them. Nor is any foreign navy likely to hand over surplus boats. The undersea component of the Bush administration’s proposed arms package for Taiwan’s military has languished for over a decade now, owing to fears of affronting Beijing. No one would execute the contract. What if Taipei plunges ahead with its quest anyway? Despite submarines’ abstract appeal, their real-world opportunity costs would prove steep and, to my mind, unbearable. Taxpayer dollars spent in pursuit of submarines, that is, are dollars not spent reengineering the navy for sea denial—the strategy that holds the greatest promise. Better to concentrate on weaponry that shipwrights can build on the island, that packs an outsized wallop, and that advances strategic goals. Taiwan should forge an assassin’smace that skims the waves—not one that dives beneath them. A story in photos: The recent Han Kuang series of exercises was a serious display of Taiwan’s military power.